The acting talent of the late legend Sir John Hurt is being celebrated on the community theatre screen which he launched. Sir John officially opened the digital projection system at Sheringham Little Theatre four years ago. The actor, who died aged 77 in January lived in North Norfolk and was a supporter of the venue’s film and stage drama work. During a week starting on Friday (May 26) the theatre will show a short season of some of his best work including an early role in the Tudor classic A Man for All Seasons, and leads in the poignant Elephant Man and spy drama Scandal. Sir John visited the venue regularly to chat to the actors appearing in the summer repertory drama season and during a launch event for the local-filmed movie In Love with Alma Cogan, in which he played a theatre manager. He also played a “part” as the pre-recorded voice of the Magic Mirror in its Snow White pantomime in 2013. Send any pictures or memories to: Sir John Hurt Memories, Sheringham Little Theatre, 2 Station Road, Sheringham, Norfolk, NR26 8RE or email debbie@sheringhamlittletheatre.com (The theatre cannot return original photographic prints, so please send copies – or scan and email them as 1 to 2MB jpegs). 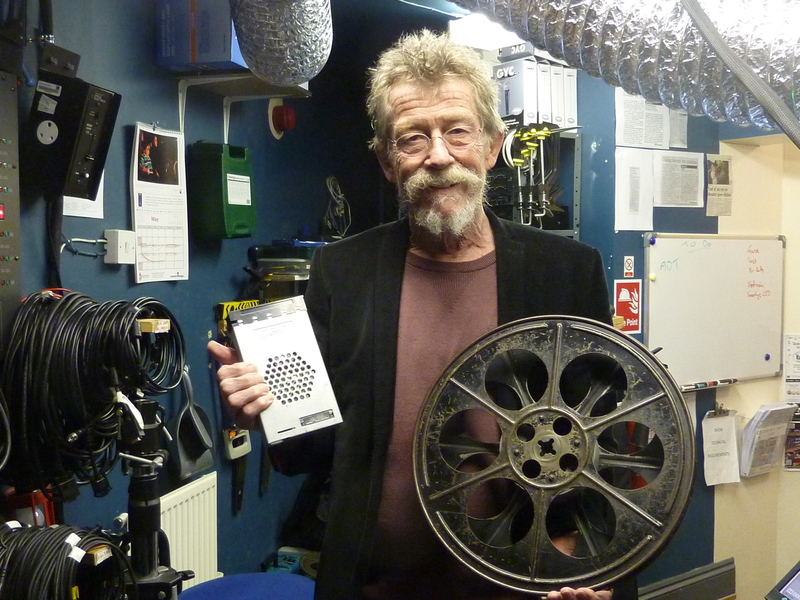 Sir John Hurt showing old and new technology when he launched Sheringham Little Theatre’s new digital projection equipment in May 2013. This entry was posted in Holt, Home Page, Sheringham and tagged cinema, Holt, John Hurt, north Norfolk, Sheringham, Sheringham Little Theatre, theatre on May 22, 2017 by Gay Webster.